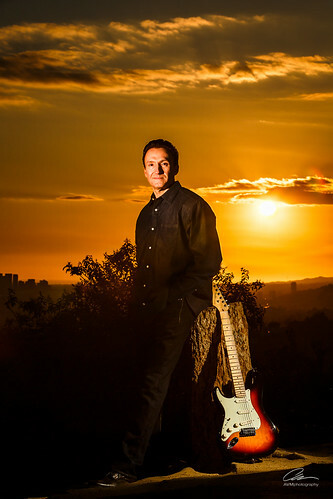 We had another awesome portrait session with Mike over this weekend, this time at Griffith Park. What a beautiful weekend it was! And what better way to finish off an awesome portrait session than to use the majestic beauty of Mother Nature herself as the backdrop! Lighting: 1 580EXII with ½ CTO gel set at ¼ power on light stand camera right pointed at the guitar. 1 580 EXII with full CTO gel set at ½ power held by VAL camera left. Both triggered by Pocket Wizard PWIIs.